After we left Blahbatuh the road east took us through the royal town of Klungkung, where we'd seen the Kertha Gosa pavilion a few days earlier (it was hard to believe we'd only been in Bali for a week at this point!). It was an auspicious day for cremations, and there were several important ones going on in Klungkung that day. The roads were blocked in several places to make way for the cremation processions, so Dewa had to take a round-about route around the town. However, at one point we found ourselves stuck behind a cremation procession - the cremation bull ahead of us was veering giddily about, almost careening into a ditch! The gamelan was a marching angklung - the same kind of instruments we play at home, slung on poles in front of the players, and they were playing Wenten's Gilak - one of the pieces we play! Crowds of schoolchildren had been given permission to come out and see the procession, and waved excitedly as we passed by. Our next stop was the village of Tenganan - a sleepy little place, rather off the tourist track. 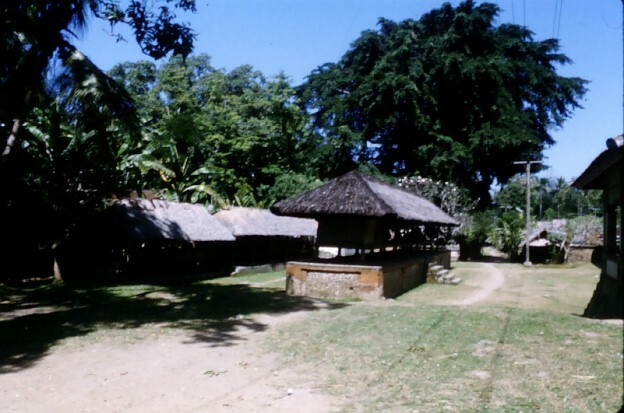 This was the village of the Bali Aga people - the original inhabitants of Bali that predated the current population. Tenganan was famous for its Ikat cloth - a little store at the entrance to the village had some beautiful cloth for sale. We all bought some to take home. 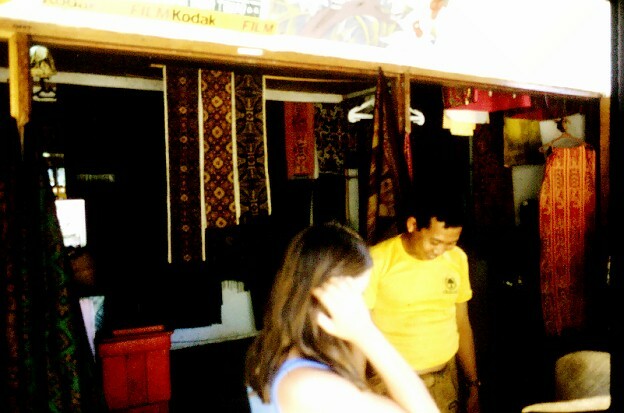 This is Julia talking to the store owner - the Ikat cloths are hanging all around. As usual, we got out our little photo album of pictures from our life back home to show the store owner. It was a great ice-breaker, and never failed to get us into some fascinating conversations. 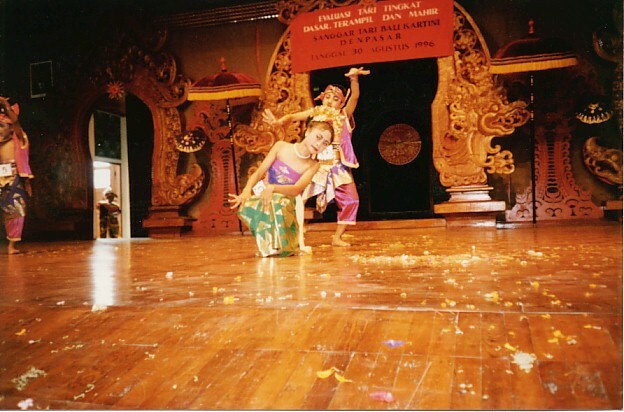 The store owner was amazed to find that we played in a gamelan orchestra, and immediately pulled out a photo of his son who had danced in the annual competition of gamelan and dance in Denpasar the previous year. He insisted that we take the photo with us - this is it! He's the dancer with the pink costume in the back. 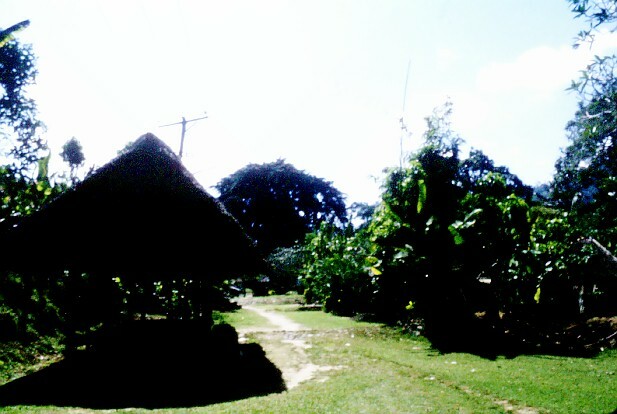 Walking around the village - deserted in the noon-day sun - it seemed very different from a typical Balinese village. This is the longhouse where the men hang out in the shade. It was clearly from a different cultural background, reminiscent of longhouses in Borneo. This is another shelter from the sun. 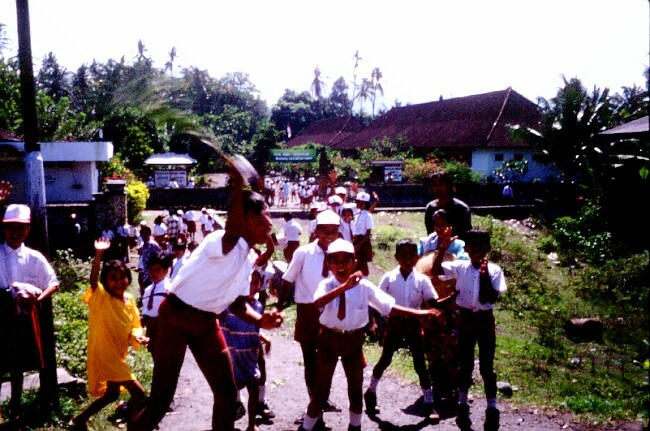 Apparently every year the people of Tenganan village hold a ritual battle, probably a re-enactment of an ancient blood sacrifice ritual that has been toned down to a ritual battle - similar ritual battles are also held in other parts of Indonesia. Here in Tenganan they use the long barbed fronds of a sort of cactus to lash at each other, drawing quite a lot of blood. Yikes.